Something for everyone at NEHCC! Fro m the pre-conference programs, to national keynote speakers and the largest trade show in the region, there is just so much to take in at the 8th annual New England Home Care & Hospice Conference and Trade Show. Be part of the action, or take the scenic route to networking, learning and relaxing. There truly is something for everyone. Join us! See our detailed brochure and register today. Keep up with all the conference news by subscribing to our blog, following us on Facebook or on Twitter. For those of you that attended the 2016 Northeast Home Health Leadership Summit, you know that the closing keynote, Angus Clark with Song Division, worked with everyone to create a theme song for the conference. And Collectively achieving something together that the group previously didn’t think was possible (writing an original song), improving group cohesiveness and productivity back in the workplace. We are healthcare in the home. As a leader in home care, you are charged with piloting uncharted terrain in a rapidly unfolding health care delivery and payment environment. Value-based purchasing, federal star ratings, bundled payments and regulatory changes dot the landscape with potential pitfalls creating what seems like an impossible operation. 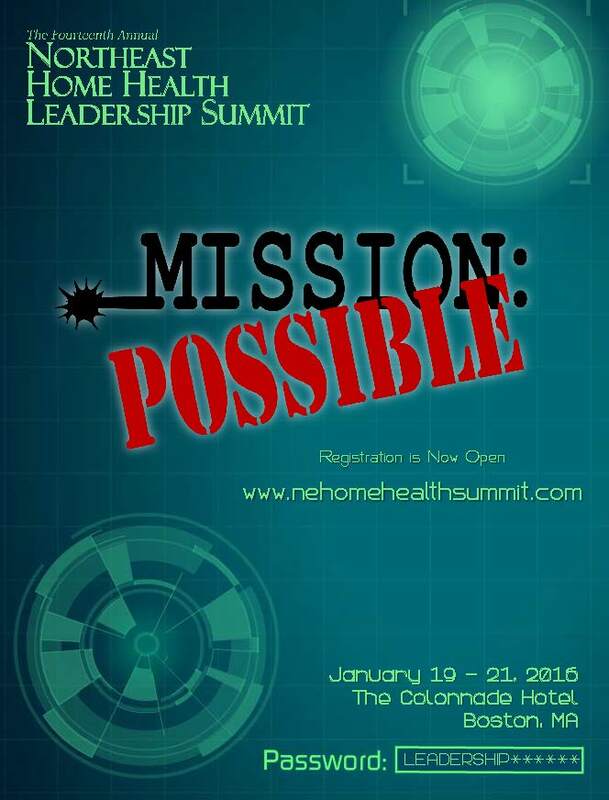 The 14th Annual Northeast Home Health Leadership Summit has gathered intelligence from across the country to offer you the inspiration, strategies, insights and tools you need to make this mission… POSSIBLE! Sharing insights and lessons learned through her experience as a first responder at the Boston marathon bombing, Natalie Stavas, named 2013 Bostonian of the Year by The Boston Globe, will teach you how to flex your leadership muscles by running towards chaos. Robert Fazzi, PhD and Tim Ashe, MS, MBA from Fazzi will guide you on successfully navigating the inevitable changes in health care and what these changes mean to every agency in the country. Armed with findings of the American Hospital Association’s soon-to-be-released report on the operational and policy changes facing the post-acute care marketplace Rochelle M. Archuleta, MSHA, MBA will provide attendees with a national roadmap for acute/post-acute collaboration. Grammy-nominated musician Angus Clark of Song Division will lead the final mission on creating a culture of innovation through his interactive session demonstrating how to cultivate group cohesiveness and productivity in your agency to innovate and succeed. Click to view the newly released NELS 2016 Brochure.